Remarks : EXQUISITE SPANISH DUPLEX IN IMMACULATE CONDITION LOVINGLY RESTORED!!!! THIS IS WHAT YOU HAVE BEEN WAITING FOR!!! 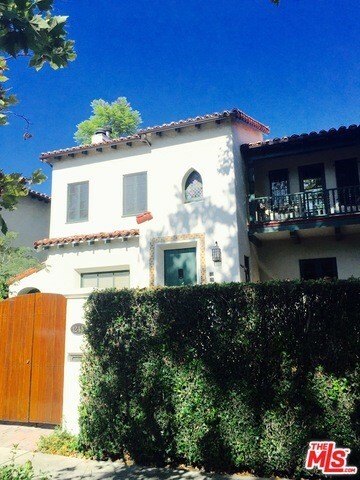 Fantastic location north of 3rd St. close to the Beverly Center, The Grove ,shops and restaurants. Enter through the gate to a grand entry way and staircase highlighted by an original stained glass window. The upper and lower units have three bedrooms and 2 bathrooms ,spacious and elegant living rooms with fireplaces and large and windows, formal dining rooms , crown molding, gleaming hardwood floors, central air and heat, recessed lighting and outdoor patios,. Renovated 4 car garage plus more space behind the gate to park a few cars. Lovely garden patio entertainment area in the back yard with a soothing fountain. Upstairs unit has all new hardwood flooring and a concealed staircase leading to a private deck with views. Too many upgrades to list. Based on information from California Regional Multiple Listing Service, Inc. as of February 20, 2019. This information is for your personal, non-commercial use and may not be used for any purpose other than to identify prospective properties you may be interested in purchasing. Display of MLS data is usually deemed reliable but is NOT guaranteed accurate by the MLS. Buyers are responsible for verifying the accuracy of all information and should investigate the data themselves or retain appropriate professionals. Information from sources other than the Listing Agent may have been included in the MLS data. Unless otherwise specified in writing, Broker/Agent has not and will not verify any information obtained from other sources. The Broker/Agent providing the information contained herein may or may not have been the Listing and/or Selling Agent.